Princesses do not always think about fashion and balls. They also care about innocent people, that are in trouble. They just want to act incognito, so no one will recognize them. 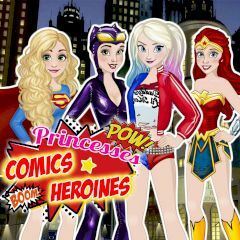 Dress up princesses in amazing super hero outfits and keep in mind, that they struggle to look unique. Can you help them get what they want?